One of the main advantages of drone-based imaging touted by both manufacturers and service providers is its low cost compared to competing technologies like airplanes and satellites. But a simple Internet search will reveal that concrete figures to back up these claims are hard to come by. This is due partly to the fact that pricing is commercially sensitive. Another more pressing reason is that drawing direct comparisons between these three technologies is inherently difficult. Which solution is most cost-effective depends on what your requirements are, what sector you are operating in and what your business model is. One area where the price comparison is relatively simple is unit price. The total cost of the launch and operation of the Landsat 8 imaging satellite was estimated by Nasa to be in the region of $855m. A Cessna 172 airplane, a model regularly used for aerial imaging, will set you back roughly $300,000. A professional automated mapping drone like senseFly’s eBee RTK will cost you about $25,000, while DJI’s Phantom 3 drone, which hovers on the border of the consumer and professional markets, is around $1,000. Operating a satellite is obviously out of reach of anyone other than national governments and all but the largest organisations. For businesses whose core activity is not providing imagery as a service, who are interested in doing their own mapping and surveying, the cost of an aircraft will also be prohibitive. While in some countries the price of training and licensing a drone operator can be a similar amount as for a pilot, the costs of buying, storing, fuelling and maintaining an airplane will eclipse those associated with a drone. Where the price comparisons become more interesting is in the field of imagery as a service. In recent years, as the price of drones has fallen and regulations around their use have been relaxed, they have emerged as major competition to the other two solutions. This is particularly evident in the field of aerial photography. While $1,000 will get you a day of drone imaging, it’s only likely to get you an hour of aerial imaging, making drones the obvious choice for customers such as real-estate agents after a couple of snaps of a fancy mansion. But despite the lower hourly cost of drones, when dealing with larger commercial applications the other two technologies can take advantage of economies of scale. 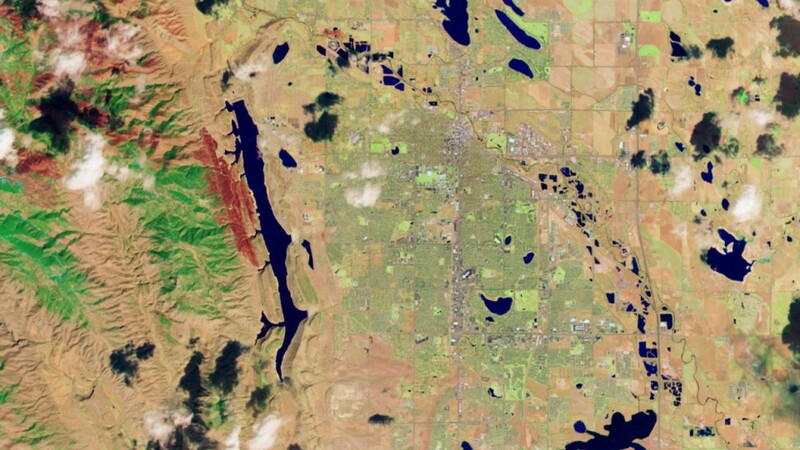 Imagery from the Landsat 8 satellite is available for free at a resolution of 30m and the RapidEye satellite system provides 5m resolution images for as little as $1.28/km2. High precision imagery from satellites like the GeoEye-1 starts at around $25/km2 for images at 50cm resolution. For those without the knowledge to do it themselves, analysing the images can increase the costs considerably. American firm Satshot processes images for use in precision agriculture and they charge $0.50 per acre ($123.50/km2) for RapidEye imagery and $0.25 for Landsat ($61.75/km2). 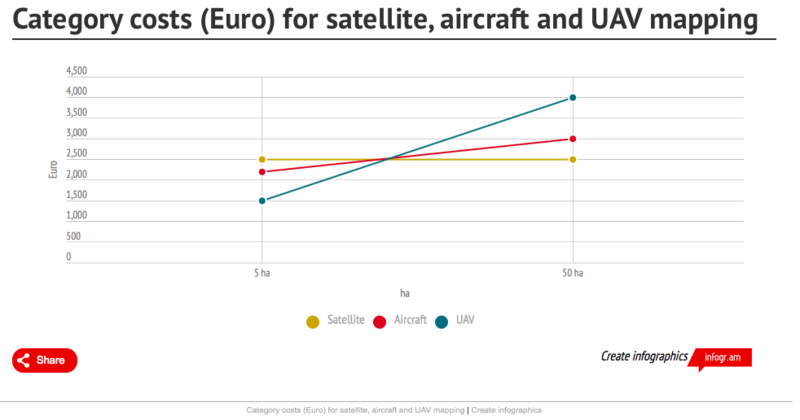 Even after analysis, satellite imagery is still markedly cheaper than either of the alternatives. Pricing per acre is much harder to come by for aerial and drone imagery services, but quoted figures tend to be around the $3-5/acre ($741-1,235/km2) mark for images designed for use in agriculture. 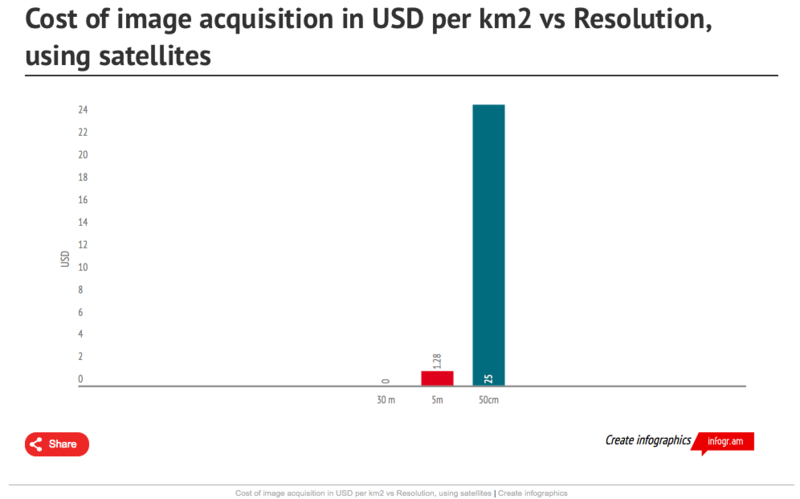 However, minimum orders of between 100km2 for high resolution satellites, and as much as 500km2 for medium resolution ones like RapidEye, mean that comparative costs rise steeply for smaller projects. In addition most satellites only revisit an area roughly every three days and poor weather conditions can also hold up imaging, making rapid a reaction to events, or fine grain temporal analysis, difficult. Resolutions measured in metres tend to be good enough for large scale projects in agriculture, resource exploration and land-use planning, but for detailed surveying work or 3D mapping the resolution available from satellites is just not good enough. 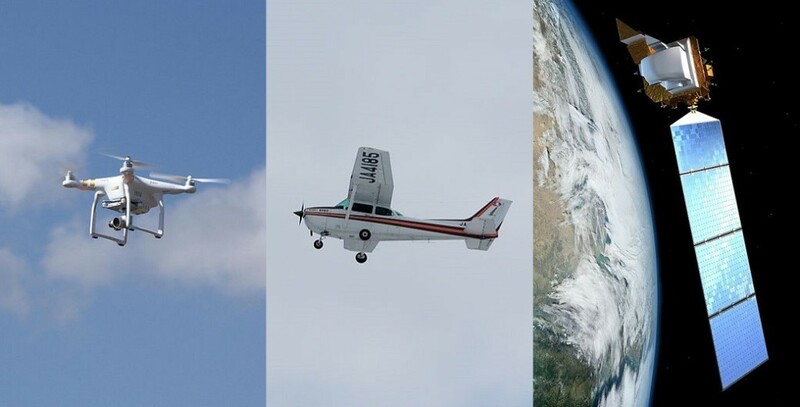 Airplanes present a compromise between satellites and drones, providing higher resolution imagery than a satellite but also being able to cover much larger areas than drones. Most drones, whether due to battery life or regulatory restrictions on beyond line of sight operations, have comparatively short range. Average prices per area are comparable between the two, but while drones can achieve that rate on just a few hectares, the high hourly price of aerial photography means those rates are only possible on large projects. However, new companies are beginning to bring these costs down by leveraging web technology and advanced route planning to service multiple customers in a single flight. Californian start-up TerrAvion provides farmers with a web interface that lets them highlight their field on a map and then offers them regular imagery throughout the season for as little as $0.73/acre. Similarly, GeoVantage has a fleet of more than 20-planes constantly flying over the US and can turnaround processed images suitable for anything from agriculture to urban planning in under 48 hours for just $1.80/acre. For foresters monitoring tree counts in the wilderness, agronomists determining nitrogen application across a massive agribusiness or geologists searching for mineral deposits mapping large areas the ability to map large areas is more important than high resolutions. This is unlikely to be an area where drones will be able to compete with airplanes and satellites, at least until their endurance has been drastically improved. But for smaller projects high starting prices for the other two options can make them an attractive option. A study comparing the use of the three technologies to acquire imagery of vineyards found that for projects under 5 hectares drones were the most economical option. But the real value of drones lies not in their price per area, but their ability to do things the other two technologies can’t. Flying so close to the ground means they are able to achieve resolutions of just a few centimetres and capture imagery at unprecedented oblique angles. This allows you to do things like provide accurate stand counts for corn fields or create high precision 3D models of everything from bridges to refinery flare stacks. This kind of close-in view was previously only possible with helicopters, but their daily rental costs are in the region of $10,000 rather than $1,000 for a drone. Drones are also able to fly in a matter of hours, making it possible to react quickly to sudden events. For a farmer wanting to assess the damage to his crops following a hail storm or an oil company wanting to investigate a sudden drop in pressure in a pipeline, the economic benefit of receiving information quickly can vastly outweigh acquisition costs. With a fully automated drone ready to fly out of the box available for just a few thousand dollars people are no longer reliant on external experts to capture high quality aerial images. Hybrid “bring your own drone” business models from companies like PrecisionHawk, DroneMapper or Agribotix, where customers collect imagery with their own drone, upload it to the cloud and then receive it back processed in hours, further reduces the technical and financial barriers to the technology. So while large mapping projects are likely to remain the domain of satellite and aerial imagery in the near future, for smaller schemes drones are quickly emerging as the most cost-effective option. And with the cost and resolution of satellite imagery constantly improving and the endurance and capabilities of drones growing by the month, aerial imaging is likely to find its position in the middle ground increasingly under threat.